What Does a Villainous Nic Cage Mean for the Green Hornet? The Green Hornet adaptation is still short a Kato, but may have found its villain in the form of Nicholas Cage. Is this mere big-name casting, or are we finally seeing director Michel Gondry's crazy plan coming together? Variety reports that Cage is in talks to play a "gangster villain" in Gondry's film adaptation of The Green Hornet, starring funnyman Seth Rogen as a bumbling superhero. Presumably, this is the same villain Gondry described in earlier interviews: a "horrible" fellow with a double-cannon gun that lets him "shoot people in both eyes with one shot." Cage's previous foray into comic-book films (the ill-conceived Ghost Rider) was anything but a success, and it is possible that, with Stephen Chow's departure from the role of popular sidekick Kato, the studio is looking to bring bigger names to the project (like Cameron Diaz, rumored to be playing the film's love interest). But I suspect that we're actually getting a glimpse of Gondry's Green Hornet master plan. Is Stephen Chow Completely Off Hornet? 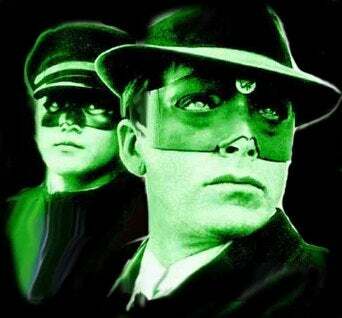 The central theme of this version of The Green Hornet is that the eponymous hero is severely outclassed by his more competent – and popular – sidekick, and Gondry might well be expanding that idea of mismatched characters across the entire cast. If Cage's particular brand of strange intensity seems at odds with Rogen's earnest persona, that's probably the point. Gondry may well be deliberately casting actors who normally wouldn't share screen time to create his won unique flavor of superhero stew. It does seem a risky balancing act for Gondry, one made even more complicated by the difficult job of recasting Kato. But I, for one, am looking forward to watching him try to pull it off.